Peter is the BBC's face of golf and one of the most familiar names and voices in the sport. He is of course commentating the 2010 Ryder Cup as this news is announced. Born in 1931 in Berlin, the son of Percy Alliss, one of the foremost British professionals between the wars, Peter followed in his father's footsteps, turning professional in 1946 at the age of 15. He played in his first Open a year later. Peter won 20 titles between 1954 and 1969, including the Italian, Spanish and Portuguese Opens in the space of three weeks in 1958. 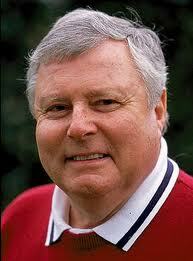 His first appearance in the Ryder Cup was in 1953 and he represented Great Britain and Ireland in the event until 1969. Following retirement from international golf he joined the BBC commentary team in 1961 and has become known to millions of viewers in the USA, Canada and Australia as well as the UK. He enjoyed a legendary commentating partnership with the late Henry Longhurst and also hosted the popular Pro-Celebrity Golf programmes and Around With Alliss. Peter is an accomplished writer whose credits include the series of Bedside Golf books, Peter Alliss – An Autobiography, The Who's Who Of Golf, Peter Alliss' Golf Heroes and a novel published in 1983 - The Duke. His definitive autobiography, My Life, was published in October 2004. Among the golf courses Peter has designed and constructed in partnership with David Thomas is The Belfry at Sutton Coldfield, national headquarters of the PGA and a Ryder Cup venue.